We knew the mountain hadn't changed much on a human time scale, so our left-wing pre-Peru-tour spiritual leader said he knew a different unexplored route, euh that is, there is no railway running up on that side, and even that is only partly true, since we found the remain of the old track. Pfff, what a mine field. No mini bus was organised this time, so we got there early in 2 cars. Our starting point was from between Llyn Gwynant and Llyn Dinas, were a track runs up through Hafod Y Llan to Cwwm Llan (church valley). It is a beautiful path following cascading waterfalls all the way up to the remains of the church. The valley levels a bit up to the old disused slate mines. We turned left, crossed the stream and it was here that we found a field full of slate slabs all about 2 feet apart, vertically sticking up. We sat down and used our combined intellect to come up with some kind of explanation. Mine was simple: there was once a generation of little Welshmen who could, just like African women, balance big slabs of slate on top of their heads. At one point in history, the railway, taking slate back into the valley, was on one side of this soft muddy field and the mine on the other. During the crossing these little talented miners, very quickly sank into the field, leaving only the stone sticking out and sometimes a few fingers, but time took care of that. It was natural selection that sadly made an end to this particular mining technique. It must be true, otherwise you would still see this habit elsewhere in Wales. 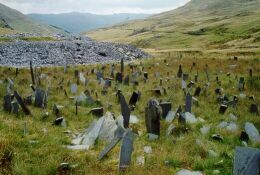 From this strange graveyard we walked on up to the ridge between Yr Aran and Mnt Snowdon. Halfway the climb, in an attempt to catch breath, we came across a very rare plant: the Lolli grass. If you ever come across it, it looks awfully like a grape, impaled on a tooth pick, left behind by a tourist, but it is not. This type of grass is known to take a whole herd of sheep on a pilgrimage. You see, picture a sheep just grazing away all day on dull and dry grass, suddenly chewing on this lovely sweet moist grape. It will see the light. It will think it found the holy grail of grass. And then look for more, as most creatures who have seen the light do. But since Loli grass is so extremely rare, it won't find it. And as with so many young religions, the choosen one will convince the whole herd Loli grass exists somewhere else and there they go on a quest. Disaster for the farmer. When we got to the ridge, we turned right and followed the ridge slowly into the clouds to the top. The whistle of the train was marking the arrival of a new batch of fully citylised travellers. It is a remarkable thing, that delicate ecosystem keeps the top at exactly 1085 m.a.s.l, that is the number of stones trampled downwards into the valley by thousands of shoes is counter balanced by layer after layer of empty coke cans, sweet wrapper and crisp bags. 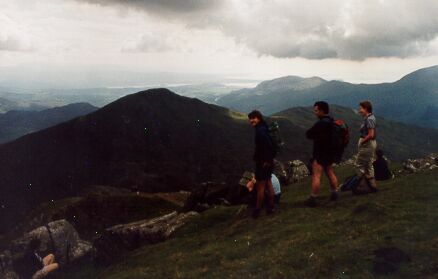 You can say that the top of mount Snowdon is really shared owner ship of Walkers and Coca Cola. 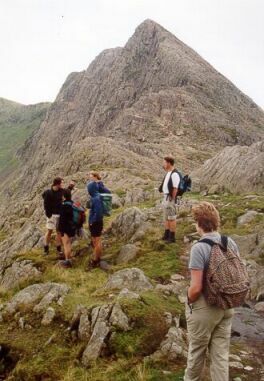 These silly Welshmen have been digging for years deep into the mountain to look for precious metals, with all attached risks of things falling unexpectedly on your head and lack of daylight and all they had to do was to walk to the top and push it down into the valley. As usual the top of Snowdon was pretty misty and we had our lunch on a stone wall. If you didn't know they existed, be aware of lap-sheep. They jump on you when you are focussing on your lunch box and are fairly agressive. Don't tell me I didn't warn you. After lunch we went down towards Y Lliwedd. This bit can be tricky, since there are a lot of loose stones and gravel and the path is extremely steep. 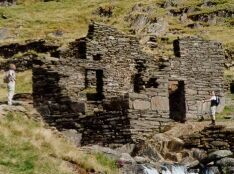 At the lowest point we turned right into Cwwm Llan again and a long decent took us back to the mines where we started or climb to Snowdon. From there a bridle path followed the stream again and one a wild brumbles berries managed to stop us. The river was excellent afterwards to cool our slightly overheated feet down. It was a perfect day.